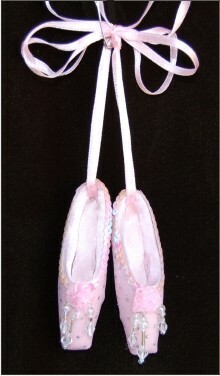 These lovely little slippers are adorned with pretty pink ribbon to form a special gift for any dancing gal. The ballet slippers Christmas ornament will delight her when it arrives in our plush velvet gift and storage bag. One of our most popular dance ornaments for girls, the ballet shoes Christmas ornament will be a cherished keepsake of exciting times in the studio and on the stage.